It seems to be an average day for Kanye West. He got involved in another fight on Monday. This time it’s with a mouthy teen. Another day, another Kanye West fracas. While it cannot be easy to be in the spotlight all of the time, West might need to find a new outlet for his anger. 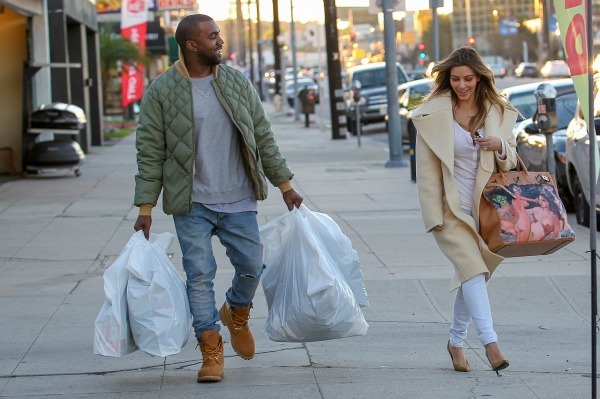 On Monday, West and girlfriend Kim Kardashian were in Beverly Hills to visit the doctor. Like every day of their lives, they were swarmed by the paparazzi. An 18-year-old guy who was entering the medical building chimed in with a few choice words to the reality star who walked in alone. According to TMZ, the teen said to Kardashian, “”F*** these fa***-a** n*****s.” While he was referring to the swarm of photographers, the TV personality reprimanded him for his use of the N-word. The guy then went into the office of chiropractor Richard Hill. Once West — who was not there for the verbal altercation — heard what happened to his fiancée, he stormed into the waiting room with her. According to witnesses who talked to TMZ, West punched the instigator right there in the office. The fight was reportedly broken up by a massage therapist who works in the office. The Beverly Hills Police Department was notified and it appears that the teen wants to press charges against the musician. Law enforcement now considers West a suspect in the battery investigation. He will be interviewed about the event and it is possible that the Los Angeles County District Attorney might get involved for possible prosecution. Perhaps West needs a serious vacation from his anger.